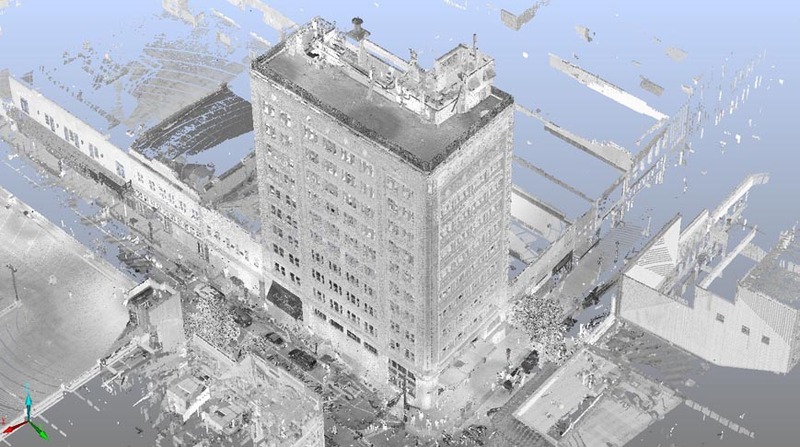 The Van Antwerp Project Team decided to create a 3D point cloud via laser scanning to assist the design team to document the as-built conditions of the Van Antwerp building and to scan pieces of the original cornice to create a fiberglass reproduction. The Van Antwerp with its original cornice is shown. The Van Antwerp has elaborate facade details and extensive work on the exterior skin is required. The team’s scan assisted in the delivery of accurate drawings for the window and storefront packages. Since we knew it would be difficult to scan in a busy, populated area we planned the scan locations using Google maps. We placed the markers on all of the ideal setup locations making sure we always had great front shots and back shots in order to stitch the scans. Planning scans ahead of time makes our work faster in the field and helps keep the cost of laser scanning minimized. This image shows how we planned the shots and communicated scanner locations back and forth. The actual scanning was completed in two days. This included scanning the exterior, roof, and generator area of the Van Antwerp building and digging up pieces of the Van Antwerp cornice from the family farm. The cornice scanning and assembly will be in Part II of the Van Antwerp post series. Once we arrived back at the Doster office we stitched the point clouds together. The stitching took an additional two days. The images below show the results of the stitching and generation of the final point cloud. After stitching the scan together, we met with Goodwyn, Mills, and Cawood to demonstrate how to use the point cloud effectively. Over the course of the last year Doster has continued to provide information to the design team to assist in the creation of Construction Documents. This includes scanning the Van Antwerp Basement in order to line up all of the columns for the structure of the building. We also created scaled images of the point cloud to help the design team trace and dimension the existing building to create documents.